This is a long document. It’s long because it has to be, not because we want it to be. If you follow it, everything will be fine. It is important that you perform all of the steps, in the order they are given here. Don’t skip any steps. Don’t try to do things in parallel. Don’t jump around. If your project is already set up in the OpenStack CI infrastructure, you might want to see Zuul Best Practices for information on adding new tests to a repository. The OpenStack CI infrastructure can be used both by official OpenStack projects and also by OpenStack-related projects. Official projects are those that have applied for this status with the technical committee. The governance site contains details on how to become one and the list of current OpenStack Project Teams. The Project Team Guide explains how OpenStack project teams work. If you add a new repository, you can make it part of an existing official OpenStack project, use it to start a new official project, or start as a related project (formerly known as StackForge). Note that only official OpenStack projects may use certain parts of the OpenStack infrastructure, especially the docs.openstack.org and specs.openstack.org server. It is important to choose a descriptive name that does not conflict with other projects. There are several places you’ll need to look to ensure uniqueness and suitability of the name. If you encounter any issues establishing a valid unique name across all of the tools we use, consult with the Release Manager before going any further. We prefer to use names made up of lower case ASCII letters and the - punctuation symbol to avoid issues with various installation tools. The base name of the repository should be unique across all of the namespace directories for git repositories under https://opendev.org/explore/repos. That is, it is not sufficient to have openstack/foo and openstack-dev/foo because that prevents us from moving those two repositories into the same namespace at some point. Python packages need to have a unique name on the Python Package Index (https://pypi.org) so we can publish source distributions to be installed via pip. It is best to name the repository and the top level Python package the same when possible so that the name used to install the dist and the name used to import the package in source files match. Try “python-” as a prefix if necessary (for example, “python-stevedore”). Some OpenStack project teams have naming conventions that must be followed. For example, the Oslo team has instructions for choosing a name for new Oslo libraries. New packages without any releases need to be manually registered on PyPI. If you do not have PyPI credentials, you should create them at https://pypi.org/account/register/ as they are required for the next step. Next your package needs to be updated so the “openstackci” user has “Owner” permissions. 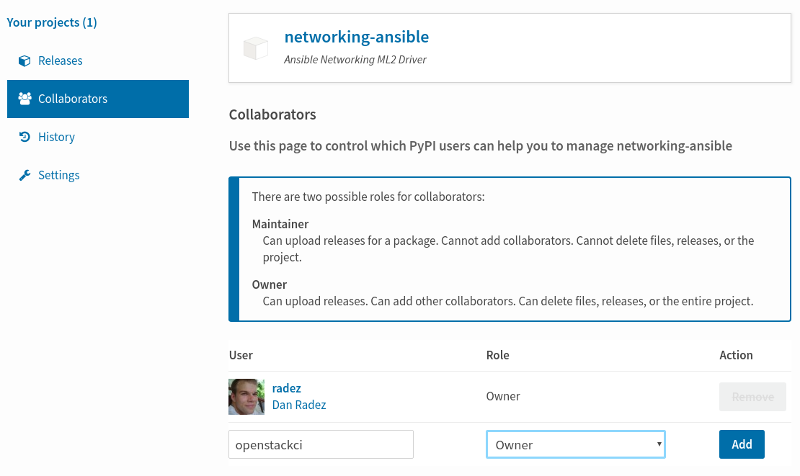 Visit https://pypi.org/manage/project/<projectname>/collaboration/ and add “openstackci” in the “User Name” field, set the role to “Owner”, and click “Add Role”. To add a project to the CI System, you need to modify some infrastructure configuration files using git and the OpenStack gerrit review server. Note that you need two changes to set up your new project for testing with OpenStack CI systems. First change to create the git repository, configure ACLs, and add the git repository to the OpenStack CI system, see Add the project to the master projects list and following sections. For official projects, this change should also link via Needed-By to a change for the openstack/governance repository to add the new repository under the project team, see Add New Repository to the Governance Repository. This change is for openstack/project-config repository. Second change to add jobs to your project, see Add Jobs for your Project. This one can only pass Zuul internal testing once the first change is merged, the repository gets created and Zuul reloads its configuration. Note: All projects should use the openstack/ namespace regardless of whether they are or intend to become official OpenStack projects. The use-storyboard: true is added so that repos will be automatically created as projects in StoryBoard (community tool for managing work being done in your project and tracking tasks). Provide a very brief description of the library. If you do not configure the upstream source here and get the project imported at project creation time you will have to push existing history into Gerrit and “review” then approve it or push some squashed set of history and “review” then approve that. If you need to preserve history the best option is to configure the upstream properly for Gerrit project creation. If you have a lot of history to import, please use the upstream field instead of creating a repository and then pushing the patches one at a time. Pushing a large number of related patches all at one time causes the CI infrastructure to slow down, which impacts work on all of the other projects using it. The groups list is used by Storyboard to be able to present grouped views of projects, stories, and tasks across multiple related repositories. After the project-config change above has merged, all repositories will be created in Storyboard and you will be able to interact with them- filing bugs and adding requests for new features in the webclient. All repositories will be added to the group that was associated with the repositories in the project-config change. Each project should have a gerrit group “<projectname>-core”, containing the normal core group, with permission to +2 changes. Release management of official projects is handled by the Release Management team through the openstack/releases repository, the default settings allow the “Release Managers” team to push tags and create branches. For unofficial projects, a second “<projectname>-release” team should be created and populated with a small group of the primary maintainers with permission to push tags to trigger releases. Create a gerrit/acls/openstack/<projectname>.config as explained in the following sections. If the git repository you are creating is using the same gerrit permissions - including core groups - as another repository, do not copy the configuration file, instead reference it. Note that this is mandatory for all official OpenStack projects and should also be set for projects that want to become official. Note the ACL file enforces strict alphabetical ordering of sections, so access sections like heads and tags must go in order and before the receive section. Tags should be created with care and treated as if they cannot be deleted. While deletion of tags can be done at the source and replicated to the git mirrors, deletion of tags is not propagated to existing git pulls of the repo. This means anyone who has done a remote update, including systems in the OpenStack infrastructure which fire on tags, will have that tag indefinitely. Members of a team that can create branches do not have access to delete branches. Instead, someone on the infrastructure team with gerrit administrator privileges will need to complete this request. The exclusiveGroupPermissions avoids the inheritance from refs/heads/* and the default setup. The other lines grant the privileges to the stable team and add back the default privileges for owners of a change, gerrit administrators, and all users. Optionally, if you only want them to be able to Verify +1 you can adjust the vote range to 0..+1 instead. Once the project is created it is strongly recommended you go to the General settings for the <projectname>-ci group in Gerrit’s WebUI and switch the Owners field to your <projectname>-core group (or <projectname>-release if you have one) so that it is no longer self-managed, allowing your project team to control the membership without needing to be members of the group themselves. See other files in the same directory for further examples. This step is not required, but if you’re considering adding a new IRC channel, see the IRC services documentation. Test jobs are run by Zuul. For a discussion of how Zuul jobs work in an OpenStack context, please see Zuul v3 Migration Guide. At this point, you should submit all the additions discussed so far as a single change to gerrit. Hold onto the Change-Id for this patch. You will need to include it in the commit message when you Add New Repository to the Governance Repository later. Every project needs at least one test job or patches will not be able to land. You can add jobs in either your new project’s .zuul.yaml file or in file the zuul.d/projects.yaml in the central repository openstack-infra/project-config. Official OpenStack projects should implement the OpenStack wide jobs mentioned in the Project Testing Interface (PTI) document. For more information on adding additional jobs into your project, see Adding In-Repo Zuul Jobs. In the past we asked that official OpenStack projects manage the PTI job config in the central projects.yaml file. This incurs review overhead that Zuul v3 was specifically designed to push onto projects themselves. In an effort to take advantage of this functionality we now ask that projects manage the PTI job config in repo. Translation jobs for all branches. Jobs that should only run against the master branch of the project they are applied to. Examples for templates that include jobs that run only against the master branch are api-ref-jobs and various periodic jobs like periodic-jobs-with-oslo-master. Jobs that are not “branch aware”. Typically these are jobs that are triggered by tag based events. As an example, the project-templates publish-to-pypi - and its variants -, release-openstack-server, publish-xstatic-to-pypi, nodejs4-publish-to-npm, puppet-release-jobs, docs-on-readthedocs include jobs that are not “branch aware” since they are triggered by tag based events. The queue configuration for the integrated queue needs to stay in the central config repository. If your project is not intended to be an official OpenStack project, you may skip this step. Each repository managed by an official OpenStack project team needs to be listed in reference/projects.yaml in the openstack/governance repository to indicate who owns the repository so we know where ATCs voting rights extend. stable, consistent, documented and generally applicable. You can check which tags to use, or the meaning of any tag, by consulting the list of currently allowed tags. so that reviewers know that the governance change has been created. However, if you are creating an entirely new OpenStack project team (i.e., adding a new top-level entry into reference/projects.yaml), you should reverse the dependency direction (the project creation change should depend on the governance change because the TC needs to approve the new project team application first). The rest of the process needs this initial import to finish, so coordinate with the Infra team, and read ahead, but don’t do any of these other steps until the import is complete and the new repository is configured. The Infra team can be contacted by pinging infra-root in the #openstack-infra channel on Freenode IRC, or via email to the openstack-infra mail list. After the review is approved and groups are created ask the Infra team to add you to both groups in Gerrit, and then you can add other members by going to https://review.opendev.org/#/admin/groups/ and filtering for your group’s names. The project team lead (PTL), at least, should be added to “<projectname>-release”, and other developers who understand the release process can volunteer to be added as well. These Gerrit groups are self-managed. This means that any member of the group is able to add or remove other members. Consider this fact carefully when deciding to add others to a group, as you need to trust them all to collaborate on group management with you. The devstack-gate tools let us install OpenStack projects in a consistent way so they can all be tested with a common configuration. If your project will not need to be installed for devstack gate jobs, you can skip this step. Keep the list in alphabetical order. The global requirements repository (openstack/requirements) controls which dependencies can be added to a project to ensure that all of OpenStack can be installed together on a single system without conflicts. It also automatically contributes updates to the requirements lists for OpenStack projects when the global requirements change. If your project is not going to participate in this requirements management, you can skip this step. Edit the projects.txt file to add the new library, adding “openstack/<projectname>” in the appropriate place in alphabetical order. All OpenStack projects should use one of our cookiecutter templates for creating an initial repository to hold the source code. If you had an existing repository ready for import when you submitted the change to project-config, you can skip this section. Cookiecutter with ‘-f’ option overwrites the contents of the <projectname> directory. Be careful when working with non-empty projects, it will overwrite any files you have which match names in the cookiecutter repository. Remember, as mentioned earlier, these commands should typically be used only if you are working with an empty repository. Other templates are available; the full list can be seen at https://opendev.org/explore/repos?q=cookiecutter&tab=. Running cookiecutter will prompt you for several settings, based on the template’s configuration. It will then update your project with a skeleton, ready to have your other files added. Every project needs test jobs. OpenStack has a number of jobs and project-templates that can be used directly in your project’s Zuul config. You can also make new jobs that inherit from existing jobs or or you can write your own from scratch. Once your project is up and running you’ll be able to add more jobs as you go and are ready for them. When you do, make sure to remove the noop-jobs template, as it’ll be telling Zuul to run jobs that don’t do anything, which is not needed once you have real jobs. For more information on writing jobs for Zuul, see https://zuul-ci.org/docs/zuul/user/config.html and Zuul Best Practices. The next step is to verify that you can submit a change request for the project, have it pass the test jobs, approve it, and then have it merge. If the new project you have added has a specified upstream you will need to add a .gitreview file to the repository once it has been created. This new file will allow you to use git review. If you configure tests for an imported project, ensure that all of the tests pass successfully before importing. Otherwise your first change needs to fix all test failures. You can run most of the tests locally using tox to verify that they pass. When your project is added to gerrit, the groups defined in the ACLs file (see Add Gerrit permissions) are created, but they are empty by default. Someone on the infrastructure team with gerrit administrator privileges will need to add you to each group. After that point, you can add other members. To check the membership of the groups, visit https://review.opendev.org/#/admin/projects/openstack/<projectname>,access – for example, https://review.opendev.org/#/admin/projects/openstack/infra-manual,access – and then click on the group names displayed on that page to review their membership. Before going any farther, make the project do something useful. If you are importing an existing project with features, you can go ahead. If you are creating a brand new project, add some code and tests to provide some minimal functionality. Update the README.rst file to include a paragraph describing the new project. Update the rest of the documentation under doc/source with information on how to contribute to the project. Add project-specific documentation covering different content areas based on the intended audience, such as installation, configuration, and administration. Follow the layout of project documentation as described in Project guide setup. To verify that the release machinery works, push a signed tag to the “gerrit” remote. Use the smallest version number possible. If this is the first release, use “0.1.0”. If other releases of the project exist, choose an appropriate next version number. You must have GnuPG installed and an OpenPGP key configured for this step. Wait a little while for the pypi job to run and publish the release. See Tagging a Release in the Project Driver’s Guide for more detail on tag pushing workflows. OpenStack projects share a common global requirements list so that all components can be installed together on the same system. If you are importing a new library project, you need to update that list to allow other projects to use your library. The devstack gate jobs install all OpenStack projects from source so that the appropriate git revisions (head, or revisions in the merge queue) are tested together. To include the new library in these tests, it needs to be included in the list of projects in the devstack gate wrapper script. For the same feature to work for developers outside of the gate, the project needs to be added to the appropriate library file of devstack. Edit the installation function in the same file to add commands to check out the project. For example, when adding an Oslo library, change install_oslo() in lib/oslo. If your project is not an official OpenStack project, skip this section. Update the https://docs.openstack.org/ site with links to your project documentation by following the instructions at Template generator details. Once you have your project set up, you might want to enable translations. For this, you first need to mark all strings so that they can be localized, use oslo.i18n for this and follow the guidelines. Note that this is just enabling translations, the actual translations are done by the i18n team, and they have to prioritize which projects to translate. First enable translation in your project, depending on whether it is a Django project, a Python project or a ReactJS project. The infra scripts consider a project as a Django project when your repository name ends with -dashboard, -ui, horizon or django_openstack_auth. Otherwise your project will be recognized as a Python project. If your repository structure is more complex, for example, with multiple python modules, or with both Django and Python projects, see More complex cases as well. Three new dependencies are required : react-intl, babel-plugin-react-intl, and react-intl-po. Update your package.json file. It should contain references to the json2pot and po2json commands. "po2json": "rip po2json -m ./i18n/extracted-messages/**/*.json"
The translated PO files will converted into JSON and placed into the ./i18n/locales directory. Set up the project on the translation server. Add the jobs to your pipelines. If the repository is planned to have stable branch, use the translation-jobs-master-stable template. Otherwise use the translation-jobs-master-only template. With these changes merged, the strings marked for translation are sent to the translation server after each merge to your project. Also, a periodic job is set up that checks daily whether there are translated strings and proposes them to your project together with translation source files. Note that the daily job will only propose translated files where the majority of the strings are translated. xargs -0 -n 1 --no-run-if-empty msgfmt --check-format -o /dev/null"
Note that the infra scripts run the same test, so adding it to your project is optional. The infra scripts recognize a project type based on its repository name. If the repository name ends with -dashboard, -ui, horizon or django_openstack_auth, it is treated as a Django project. Otherwise it is treated as a Python project. If your repository declares multiple python modules in packages entry in [files] section in setup.cfg, the infra scripts run translation jobs for each python module. Your repository contains both Django and Python code. Your repository defines multiple python modules, but you just want to run the translation jobs for specific module(s). In such cases you can declare how each python module should be handled manually in setup.cfg. Python modules declared in django_modules and python_modules are treated as Django project and Python project respectively. If django_modules or python_modules entry does not exist, it is interpreted that there are no such modules. You also need to setup your repository following the instruction for Python and/or Django project above appropriately. There are a couple of best practices for setting up jobs. Note that the standard OpenStack jobs should be in the project-config repository, see What to Convert?. Jobs in Zuul are self-testing, which means that the change adding a new job can run with that job applied into the project’s pipelines. It’s a good idea when adding a new job in your project to put it at least into the check pipeline so that you can verify that it runs as expected. If you use the same set of tests in several repositories, introduce a new template and use that one. A job can either be voting or non-voting. If you have a job that is voting in one repository but non-voting in another, you can indicate this by using a variant. To make a single job non-voting everywhere, add voting: false in the job definition. To use a job that is otherwise voting in your project but in a non-voting manner, add voting: false to its entry in your project pipeline definition. Non-voting jobs should only be added to check queues. Do not add them to the gate queue since running non-voting jobs in the gate is just a waste of resources. If you want to run the job only on a specific stable branch, add a branch matcher to the job definition. If, instead, you want to use an existing job in your project but only on a specific branch, apply it in the project pipeline definition. The job above will run on master but also on newer stable branches like stable/mitaka. It will not run on the old stable/juno and stable/kilo branches. For a project being added to existing official OpenStack project: Create an openstack/governance change and add a “Depends-On: project-change-url” of the change you make in the following steps to the commit message, and add a comment in the openstack/project-config change that references the governance change. You will also make sure the PTL has expressed approval for the addition in some way. When preparing to rename a project, begin by making changes to the files in the openstack/project-config repository related to your project. Members of the infrastructure team will review your change. Finally, add it to the Upcoming Project Renames section of the Infrastructure Team Meeting page to make sure it’s included in the next rename window. Renames have to be done during a Gerrit maintenance window scheduled by the Infrastructure team, so it may take a few weeks for your rename to be completed. Post rename, a member of the Infrastructure team will submit a patch to update the .gitreview file in the renamed project to point to the new project name. Is there existing content to import? If the team want to preserve the history, they have to use the upstream key word to import. The infra team will not push anything to your repo - and cannot hand out those permissions either. Will this be an official project? Then it needs a governance review, with a link to it via “Needed-By”, and get PTL+1. Will the repo release on pypi? Check that it https://pypi.org is set up correctly.